The central nervous system is the most complex tissue in the organism. In mammalian embryogenesis, the brain arises from immature neural progenitors that progressively differentiate into neurons, glia cells and oligodendrocytes. Several projects in our lab are aimed to understand genetic processes that control formation of the mouse brain. Using transgenic mice, we study morphogenetic regulators of the cell fate, cell cycle and migration. We isolate and grow in culture dish neural stem cells and we study their properties such as differentiation plasticity, response to proliferative signals and survival upon transplantation. Neurogenesis in the developing neocortex is a strictly regulated process of cell division and differentiation. Here we report that a gradual retreat of canonical Wnt signaling in the cortex from lateral-to-medial and anterior-to-posterior is a prerequisite of neurogenesis. 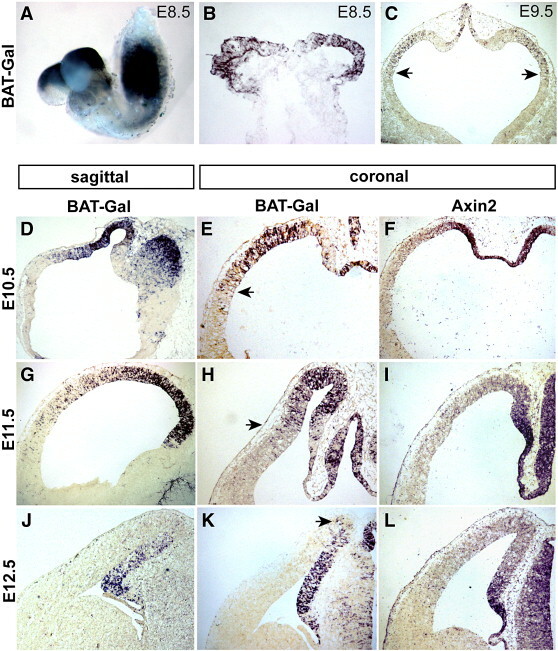 Ectopic expression of a beta-catenin/LEF1 fusion protein maintains active canonical Wnt signaling in the developing cortex and delays the expression onset of the neurogenic factors Pax6, Ngn2 and Tbr2 and subsequent neurogenesis. Contrary to this, conditional ablation of beta-catenin accelerates expression of the same neurogenic genes. Furthermore, we show that a sustained canonical Wnt activity in the lateral cortex gives rise to cells with hippocampal characteristics in the cortical plate at the expense of the cortical fate, and to cells with dentate gyrus characteristics in the hippocampus. This suggests that the dose of canonical Wnt signaling determines cellular fate in the developing cortex and hippocampus, and that recession of Wnt signaling acts as a morphogenetic gradient regulating neurogenesis in the cortex. Gradual movement of the canonical Wnt activity away from the lateral cortex. (A) Whole mount in situ hybridization with the β-gal probe of an embryo at E8.5 from the BAT-Gal mouse that serves as a Wnt reporter. (B) Transversal section of the embryo shown in panel A. (D, G, J) In situ hybridization on sagittal sections from the BAT-Gal mouse between E10.5 and E12.5. (C, E, H, K)BAT-Gal staining on coronal sections E9.5–E12.5. Note the gradual disappearance of the activity in anterior-to-posterior and lateral-to-medial direction; arrows show expression boundaries. (F, I, L) In situ hybridization with the Axin2 probe on coronal sections E10.5–E12.5. Wnt/β-catenin signaling regulates many processes during vertebrate development. To study transcriptional targets of canonical Wnt signaling, we used the conditional Cre/loxP system in mouse to ectopically activate β-catenin during central nervous system development. We show that the activation of Wnt/β-catenin signaling in the embryonic mouse telencephalon results in the up-regulation of Sp5 gene, which encodes a member of the Sp1 transcription factor family. A proximal promoter of Sp5 gene is highly evolutionarily conserved and contains five TCF/LEF binding sites that mediate direct regulation of Sp5 expression by canonical Wnt signaling. We provide evidence that Sp5 works as a transcriptional repressor and has three independent repressor domains, called R1, R2, and R3, respectively. Furthermore, we show that the repression activity of R1 domain is mediated through direct interaction with a transcriptional corepressor mSin3a. Finally, our data strongly suggest that Sp5 has the same DNA binding specificity as Sp1 and represses Sp1 target genes such as p21. We conclude that Sp5 transcription factor mediates the downstream responses to Wnt/β-catenin signaling by directly repressing Sp1 target genes. or Axin2 (F and G)-specific probes. Neural progenitors of the mouse forebrain can be propagated in vitro as neurospheres in the presence of bFGF and EGF. However, less is understood whether regional characteristics or developmental stage properties of these cells are maintained in neurosphere cultures. Here we show that the original cell fate is lost in neurosphere cultures. We isolated neural progenitors from the dorsal telencephalon of D6-GFP mice and cultured them in vitro. The expression profile was specifically changed in cultured cells in just three passages. Markers of the dorsal forebrain were downregulated and several ventrally-expressed genes were induced. The altered gene expression led to a profound phenotypic change of cultured cells. D6-GFP positive cortical progenitors produce excitatory neurons in the cortex and few astrocytes in vivo but after culture in vitro, these cells differentiate into many astrocytes and also oligodendrocytes and inhibitory neurons. Wnt signaling in cultured neurospheres was downregulated in the same manner as other dorsal markers but dominant active Wnt signaling slowed down the loss of the dorsal identity in neurospheres. (A) Affymetrix scatter graph compares expression pattern in primary cortical D6-GFP+ cells at E12.5 (x axis) and neurospheres cultured for one month (y axis). Parallel lines depict 2-, 3-, 5- and 10-fold difference in gene expression (B) Real-time PCR. Dorsal-specific genes (Emx1/2, Pax6) are downregulated in neurospheres while the expression the ventral markers (Olig1/2, Dlx2, Mash1) is induced. Dorsal telencephalic progenitors are labeled with D6-GFP fluorescence and generate mainly neurons and few glia in vivo. Neurospheres derived from D6-GFP+ cells acquire multipotent capacity to produce neurons, glia and oligodendrocytes. Neurons differentiating from neurospheres also express markers of inhibitory neurons that were not seen in the original cells in vivo.